Last week, Socialbakers launched the CheerMeter – a social media tool that tracks and analyzes real-time global Twitter buzz around sports, athletes, nations and brands. Our analysis of the Opening Day Ceremony revealed that fans posted more than 1.9 million tweets relevant to the games! 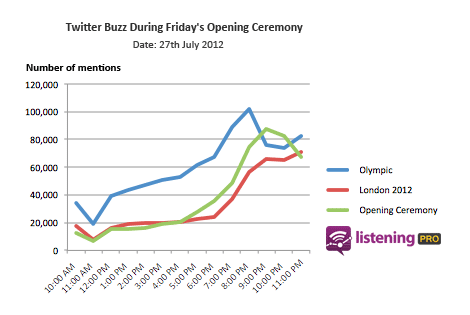 The buzz peaked a couple of minutes before the start of the ceremony, reaching over 100,000 tweets per hour! 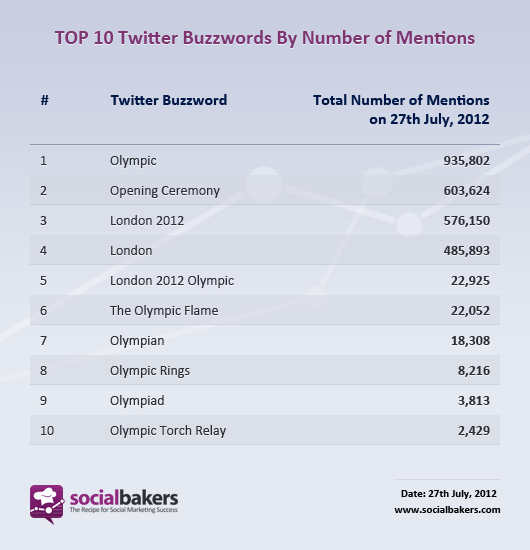 Tweets about the Opening Ceremony ranked second with more than 600,000 mentions, while London and its associated buzzwords reached more than half a million, ranking third overall on the list of top mentioned words on the day of the Opening. According to our analytics, fans’ cheers reached 2,698,029 mentions, which correspond to 84 keywords. Scroll down to see the list of top 10 Twitter buzzwords on that day and the number of mentions they received. Did fans really like the Opening Ceremony? Don’t forget to follow the Socialbakers’ CheerMeter as we continue to track all the excitement and buzz!